For all who ask, “Where has my struggle led me?” or for those “on the road” who have had the courage to embark on the journey but seek the illumination, this work will inspire. 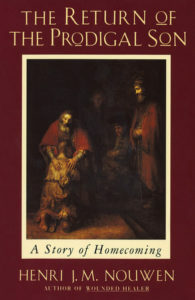 In seizing the inspiration that came to him through Rembrandt’s depiction of the powerful Gospel story, Henri Nouwen probes the several movements of the parable: the younger son’s return, the father’s restoration of sonship, the elder son’s vengefulness, and the father’s compassion. In his reflection on Rembrandt in light of his own life journey, the author evokes a powerful drama of the parable in a rich, captivating way that is sure to reverberate in the hearts of readers. The themes of homecoming, affirmation, and reconciliation will be newly discovered by all who have known loneliness, dejection, jealousy, or anger. The challenge to love as the father and be loved as the son will be seen as the ultimate revelation of the parable known to Christians throughout time, and here represented with a vigor and power fresh for our times.